The start of our home based baking business was actually a funny one. We started our business as way way to provide a local restaurant with the best darn key lime pie the owner had ever tasted. Our home baking business was short lived, the experience was so 'sweet' (excuse the pun) that we are tempted to begin it again as a source of extra income for my nieces this summer. We had a small business with just one customer. But, it stayed ahead of expenses (for a while) and we really had a good time with it. Our Home Based Baking Business - Humble Beginnings - It All Began With Our Local Favorite Restaurant. It's a well-known place here in town and it's not part of a chain. People like to go there for a taste of Alabama country cooking. We'd been eating there for years and years and the owners knew us well. My husband was always complaining with the owner about their key lime pie. Jim would always order it and always complain. It was a running joke that embarrassed the kids at the end of every meal we had there. Well, the owner would give Jim a hard time and say, "Well, if you can do better we'll sell yours." I don't know what made him do it. But, one day, Jim just got up and walked into the kitchen and made a pie and announced that we were going to dinner at Jake's that evening. We walked in with our pie in hand and just sat down with it at the table. Dinner that night was hilariously funny - Jim kept saying, "Pie? What pie??" whenever anyone asked him about it. But, Jake stopped by at the end of the meal and had a slice with him. Initially, I thought that would be it just a fun evening. But, the thing is, Jim really is a talented baker. Jake loved his pie and offered to buy them from him. Jim was only able to make about $2.00 on each pie he made for the restaurant. And, they needed enough of one flavor to last though a whole dinner service. 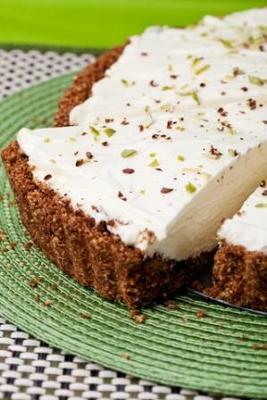 So, basically, Jim ended up making key lime pies for their Sunday dinner service - that was about all Jim could handle. And, it was a lot of pies! In the end, we weren't making enough to have the modifications done to the kitchen to get up to health code (we needed to have a hand washing sink installed). And, Jake's really needed us to be up to code to continue on. Still, it was rewarding for him. His pie was a special feature for Sundays and having people pay you for something you make with your own hands is very rewarding. It was a good time for us. And, with the economy just awful down here, I am thinking about getting an SBA loan to get the house up to code and see if I can put my nieces to work this summer. I think that we would need to start out with the same startup model -- get one or two restaurant customers and just keep them happy with something that's too much of a hassle for them to do.